This past April, as a result of Vandre's efforts, the US Department of Defense (DoD) launched the Armed Forces Institute of Regenerative Medicine (AFIRM), comprising several government agencies. The new institute announced it would put at least US$250 million toward tissue engineering over five years, with the goal of helping soldiers maimed in Iraq and Afghanistan. Yet new money raised by AFIRM amounts to only $85 million (Table 1), and despite the fanfare announcing the program, investigators have been unusually tight-lipped about their work. How funds are being distributed remains unclear, as does the process that will be used to assess results. Vandre started AFIRM in 2007 while directing the army's Combat Casualty Care Research Program. After raising $42.5 million — mainly from military and veterans' agencies — he notified researchers they could apply for these funds for regenerative medicine via announcements on Grants.gov, through the Tissue Engineering and Regenerative Medicine International Society and through the National Institute of Biomedical Imaging and Bioengineering. Seven research teams applied, of which two were asked to present to AFIRM in December 2007. Around this time Vandre heard directly from White House staffer Chris Papagianis, special assistant on domestic policy for the president. "They were looking to speak about stem cells in the State of the Union address," says Vandre. After some discussion, the Bush administration asked what it could do help. "They had the DoD double our budget," says Vandre. This brought the total funding to $85 million and provided enough money to support both finalists for five years, a total of $17 million a year. One of the AFIRM teams is headed by Wake Forest University Baptist Medical Center in Winston-Salem, North Carolina, and the McGowan Institute for Regenerative Medicine at the University of Pittsburgh Medical Center, Pennsylvania; the other is led by Rutgers University in Newark, New Jersey, and the Cleveland Clinic in Ohio. To get the $250 million sum, AFIRM counted grants scientists had already received from other agencies— about $109 million among 40 scientists — toward the total pot. Unlike applicants for most government grants, contenders were also evaluated on their ability to get money from other sources. "We asked teams to put together a plan that showed how they would get their technology ready for clinical trials, and the resources they had to contribute were taken into consideration," explains Vandre. Although $85 million is a lot less than $250 million, it is still a significant source of funds. Principal investigators decide how the funds are split between the collaborating scientists, who come from more than 20 different institutions (Table 2). Specific amounts awarded to each team member have not been disclosed, but Anthony Atala, who heads the Wake Forest group, says participating researchers will each be funded at roughly $100,000 to $300,000 each year. These sums are similar to many NIH grants. As expected of a programme that has the enthusiastic support of the Bush administration, AFIRM will steer clear of embryonic stem (ES) cells. Since the technologies are supposed to be moving quickly towards clinical trials, Vandre says embryonic stem cell technologies would not likely be applicable even in a more favorable political environment. Many are not far enough along in development to meet time constraints. Though AFIRM plans to use some placental or amniotic fluid stem cells, most projects rely on cells taken from the patients themselves, thus sidestepping issues of tissue rejection. Vandre's argument passes muster with Jonathan Moreno, a professor of medical ethics at the University of Pennsylvania and a vocal critic of the Bush Administration's stem cell policies. "In this case they can easily work within federal restrictions," he says. Though AFIRM is scheduled to last only five years, little has been said about its specific goals. When asked if AFIRM is looking to heal certain types of wounds, Vandre instead described another priority. "Our long-term goal is to be able to regenerate limbs — to regrow their arms," he says. This raises questions about AFIRM's declaration that it will fund late-stage and translational research aimed at helping veterans who served in Afghanistan and Iraq. There is little chance that researchers will be able to regenerate limbs within the next five years, says William Heetderks, director of extramural science programmes at the National Institute of Biomedical Imaging and Bioengineering in Bethesda, Maryland, and a member of the NIH AFIRM team. With the exception of MRL mice — a bioengineered mouse model that has unique regenerative potential — there are few options for researchers to even test regenerative pathways, and no known treatments can make adult mammals regrow limbs. When pushed, Vandre says that many projects aim not to regrow limbs but to restore function to limbs that would otherwise be amputated. Although specifics of the winning proposals have not been released, AFIRM deliverables include "hand and limb transplantation" and "digit regeneration" (Table 3). Other projects do seem to meet the translational medicine criterion. These address craniofacial scarring, limb reconstruction, wound healing and compartment syndrome, a condition where injured tissue swells so much that it blocks its own blood supply. Healing burns is a high priority. James Holmes of Wake Forest University, who is overseeing some AFIRM projects with that goal, says several skin-replacement procedures are rapidly progressing toward clinical trials, although not all involve stem cells. In addition to academic researchers, the tissue regeneration companies Organogenesis, in Canton, Massachusetts, and Intercytex, in Woburn, Massachusetts, are involved in Holmes's project to make an "off-the-shelf composite skin substitute," Holmes says. Details about the composite materials and the final end product cannot be released, he says, but trials in humans should start by 2012. AFIRM also hopes to develop techniques to grow out a patient's own cells. Many soldiers are burned so extensively that there is not enough of their own skin available for a graft, and skin from cadavers is prone to rejection. The most conventional of the AFIRM projects deal with optimizing skin-grafting techniques, with more novel skin spraying and printing technologies moving forward as well. Holmes is optimistic that cell-spraying technologies will move into clinical trials within the next two years, but "the other projects are pretty early stage," he says. Cell printing, for example, requires the establishment of cell banks that can be used to fill the printing devices. Another AFIRM project aims to develop mesenchymal stem cells for bone regeneration. 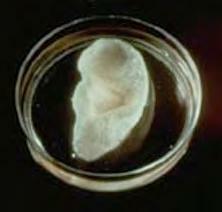 Researchers will introduce the cells into a polycarbonate scaffolding currently used in bone regeneration procedures. Joachim Kohn, of Rutgers University, heads one of the consortia developing this project. He says that the particular polymer, which comes out of his own lab, is ideal for medical use because it does not contain bisphenol A, a potential endocrine disrupter that recently caused Canada to pull baby bottles from store shelves. "A lot of [polycarbonate on the market] is cytotoxic," says Kohn, "but [ours] is all nontoxic." Not all projects involve stem cells. Within six months, other AFIRM researchers hope to start testing a second treatment that uses standard cultured fibroblasts to redress mobility-impeding scars. Currently, soldiers with these scars can sometimes gain the ability to extend their arms a little further after undergoing an operation, but Holmes hopes that injecting the product around affected joints will produce the same benefits without the surgery. Similarly, other researchers want to know whether autologous fat transfer — sucking fat from one area and injecting it into another — can help scars fade, which could improve both the function and appearance of damaged areas. In one trial, AFIRM researchers plan to isolate and expand adipose stem cells taken from each patient and then insert these cells into scarred regions. In a different trial, preparation of adipose tissue before insertion will be minimal; stem cells will simply be part of a heterogenous mixture. The autologous fat transfer project represents low-hanging fruit that requires only a coordinated effort to pluck. The basic procedure without cell processing is already being performed clinically, although primarily for cosmetic purposes, but still no one has rigorously defined the desired benefit and assessed it compared with a control group. Kohn expects that it will be easy to figure out which approaches work best. "This data can be easily collected and the technique quickly perfected to meet the needs of soldiers." Despite AFIRM's many innovative projects, how the results will be reviewed and disseminated remains opaque. According to Kohn, AFIRM's findings may never be released to the general public. "AFIRM does a lot of research, but it's not research for publication's sake." Instead the projects are intended to benefit the "war fighter." How and whether the results of AFIRM projects will be subjected to peer-review analysis is also undetermined, and AFIRM will control the release if so. But Rosemarie Hunziker, director of the NIH's regenerative medicine programme (housed within the National Institute of Biomedical Imaging and Bioengineering) says that AFIRM, although still "the army's baby", does foster collaboration among its constituent agencies. "It's a good opportunity for researchers to draw from other agencies, and for government groups to work together and inform one another's missions." "We have to be a little bit tight-lipped, especially since we are early in the process," says Kohn, adding that some AFIRM projects rely on detailed casualty lists, or other classified information. Vandre said he could not release details because of the affiliated intellectual property. Most investigators contacted for this article did not respond to requests for further information, and those who did provided few details. Vandre says most cells used in the various projects are autologous, but shared few details about how they will be purified, processed or expanded. Nor will researchers disclose other metrics typical of animal and human trials, such as the numbers of research subjects, the types of models and the desired endpoints. It may be that project details are not being released because AFIRM plans to cut many studies within months. The strategy is to weed out the least promising projects quickly, and an interagency panel representing AFIRM's funding base will review the progress made, with the goal of eliminating as many as 25% of the initial projects within the first year alone. More projects will be cut in subsequent years, and the money will be funnelled to those deemed to have the best shot at clinical success. Rather than exploring one solution to a problem at a time, AFIRM is exploring many projects in parallel — this requires ongoing evaluation, but it's faster than pursuing one idea at a time, says Atala. "The conventional approach means you write a grant and pursue one single option," he says, "but then you have to wait three years to get results, and even then you may need to start over." With wounded veterans from Iraq and Afghanistan now returning home, the need for new treatments is great. Eighty-two per cent of wounded soldiers have damage to their arms, legs, hands and feet, and 30% have wounds to the face and the head. Although the death rate from injuries is dropping, more veterans are facing lives with broken bodies, says Vandre. "Now we need to focus on putting them back together. We want to keep them on active duty and help them have normal lives."